This 2001 built, double story townhouse, underwent an extensive renovation. Out with the creams and in with a new modern, crisp colour palette! The rooms for updating included the Kitchen, Ensuite, Powder room, Study and Laundry. Perhaps the most difficult aspect of this project was the sheer size versus the respective timeline for completion. Our client was expecting a completed result by her birthday. From contract date to begin of construction was only 8 days and practical completion was just 6 weeks away! We delivered all four rooms 5 days early, at 5 weeks and 2 days! Delivered on time and on budget, made for some very happy clients! The kitchen was more of a refresh than complete redesign, as its previous design functioned well for our clients. The designer decided to maintaining the same U shaped footprint also to prevent disturbing relatively new floating floorboards. 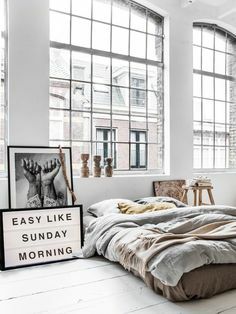 Large maintained windows at either end of the space provide the room with an abundance of natural light. While suiting the overall space, this layout provides lots of usable bench space and also acts as a breakfast bar. Statement Maximum Porcelain Calacatta Mitred 40mm Stone was selected for the kitchen benchtops. The luxurious calcatta benchtop caries up the wall into the splashback, highlighted by warm under cabinet LED lighting. 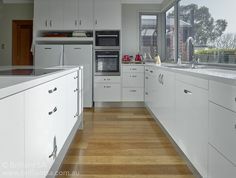 Seamless sheen white finger pull joinery gleam and give the room a crisp modern look. The contrasting gloss grey selected for the breakfast bar back panel gives the kitchen added depth. Two flush bi-fold doors hide this laundry neatly in the understairs. 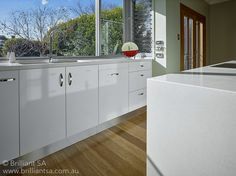 Matching Porcelain Calacatta stone benchtops tie in with the nearby kitchen. The washer and dryer were both moved under the bench in order to create more usable working space. Complementary 300×600 biscuit white splashback tiles and misty grey floor tiles were selected to minimise cost in this, often hidden area. As with the kitchen, custom joinery in Polytec’s porcelain sheen finish was the focal point. As a modern feature of the room open contrasting shelving in Polytec natural oak riven finish separates the gloss cabinetry. 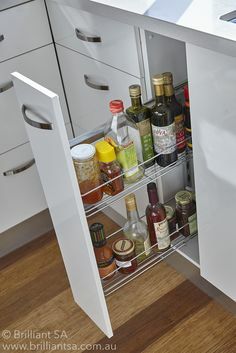 To maintain the new modern feel cupboard doors are touch open, while only the centre bottom drawers have sleek stainless steel handles. 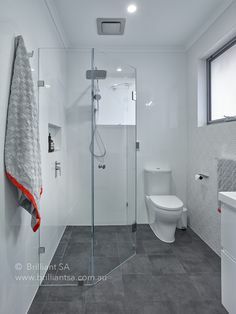 Similarly to the entire renovation, the ensuite is clean and modern. 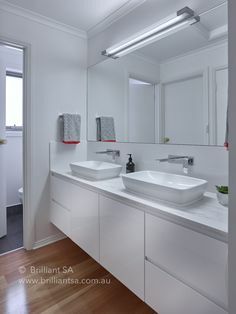 A nib wall running the length of the room conceals the inwall cistern toilet system and recesses a mirrored shaving cabinet flush. 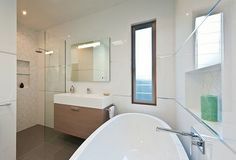 While sand coloured semi polished porcelain 300×600 floor tiles feature up the far wall to a frameless walk in shower. A small shower niche with feature mosaic tiles provides storage for everyday essentials. 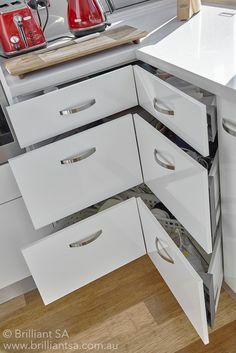 While the wall hung vanity and mirrored shaving cabinet provide excessive storage options. Similarly to the ensuite, a small nib wall conceals the inwall cistern toilet system. Sand coloured semi polished porcelain 300×600 floor tiles feature up the nib wall to elongate the room. 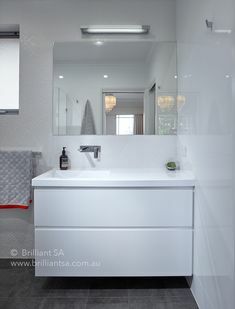 The existing, slimline vanity was reused while new modern accessories finish off the clean look. Designed by Steve Mahlo and built by the Brilliant SA Team.